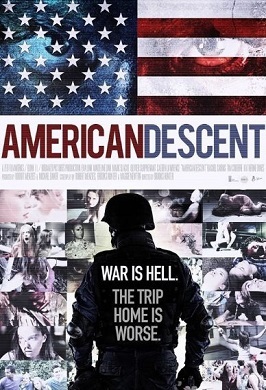 A found footage, revenge torture vetsploitation teen detective story quintuple threat, American Descent is quite ambitious and for the most part interesting. That being said, it’s not without considerable flaws. Found footage is undoubtedly effective at generating scares with its immediacy and intimacy, and at a very low cost. However it’s a bit like a fighter with a limited skill set who yet has a “puncher’s chance.” Like the fighter, the conceit’s flaws are exposed as you go into the deeper rounds. That means falling victim to the usual petty annoyances inherent in a documentary style film, namely, a protagonist compulsion to video every single act and occasional cam shakiness. That’s a shame, as with a few tweaks, American Descent could’ve been championship material as it’s got strong performances and solid visual style. In the film, a much-loved family man is stationed in Afghanistan. He Skypes his two teen daughters whenever he can to keep in touch. One day, a mysterious package arrives at their school, a DVD. The label-less package is ostensibly sent from his base, something their dad denies via webcam. Their interest piqued, the kids plop the video in. They then see strange, frightening footage of a woman tied to a tree in the middle of the woods. Not knowing what to do, they enlist the help of two cineaste friends to try to suss out if the vid’s legit, then try to unravel the mystery of what might have happened. 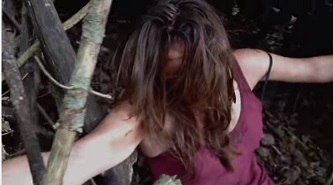 When one of them recognizes a possible filming location in the footage, they head to that part of the woods where they find another clue: a USB key. One criticism levied at documentary-style films is that it takes the usually dumb horror protagonists one typically finds in this genre and makes them not just dumb but solipsistic too. However, that’s tempered by smart sisters Kate and Morgan (played by real-life sisters Eva and Madeline Link). One’s pretty and practical, the other, a brooding conspiratorial tomboy. Their dynamic is terrific. Also terrific, some really naturalistic and genuine performances all around as well as how the teen investigative team gets further and further into the morass via odd clues left at various scenes (yes, they address the issue of taking the contentious evidence to the police). The biggest debit is that the antagonist’s motivations really don’t make sense. Also, the denouement is effectively given away in the trailer. These are two considerable hurdles. This entry was posted in Horror and tagged 2010s movies, Canadian film, found footage, high school movies by Really Awful Movies. Bookmark the permalink.